The first thing that struck me was the whole ‘beauty for ashes’ thing – the change that God wrots in our lives when we allow Him to make the ‘ugly’ beautiful…..
the 2nd thing that struck me is that no matter how ‘barbed’ or hurtful we may be to others at times, how much we shut others out of our lives or how much we may hide away from the world/build walls around ourselves, God may still use us to His purpose, even in our brokenness, even in our hurtfullness. Even in our sin, God still uses us and sometimes He uses us inspite of ourselves to bring healing, beautiful etc into others lives…. Great to see you hop aboard, Avis. The photo was taken at the airport in Mt Hagen in the Highlands of PNG. 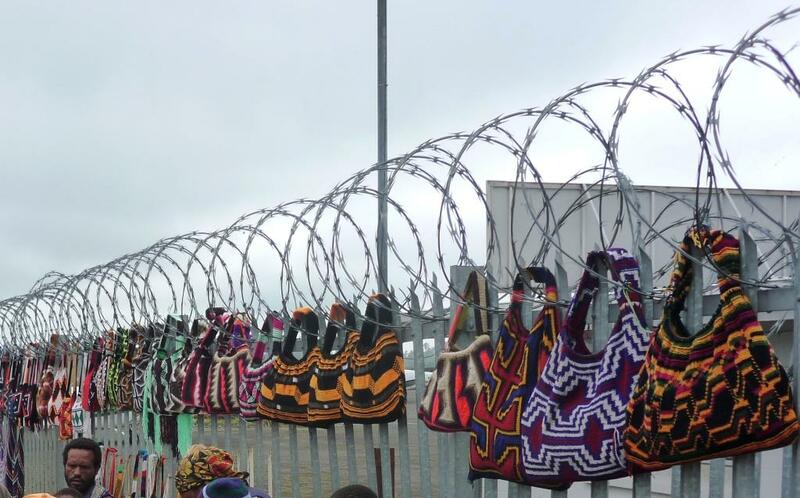 It was so striking to see these brightly-coloured bags hanging on the wire. I like your reflections!